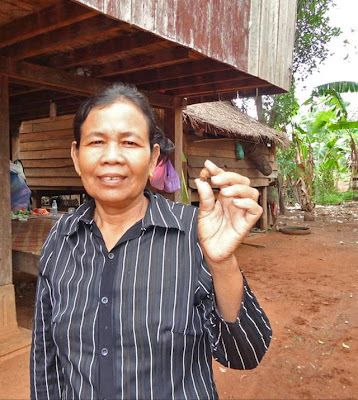 Mrs. Thim Thorn has lived with a bullet in her back for the past 30 years. During the civil unrest in her country under the Khmer Rouge, Mrs. Thorn was forced to work as a 'transportation woman,' bringing food and army supplies to the battle field when vehicles were inaccessible. It was during this time that Mrs. Thorn was shot in the back by a government army soldier. After the war ended, she found herself injured, widowed, and with five children needing her care. When Food for the Hungry (FH) Canada board members visited the Along Veng region (Cambodia) last November 2012, they paid a house call to a registered FH sponsor child. An numerical error led them to the house of Mrs. Thorn, but it quickly became apparent that the visit was not a coincidental mistake. Mrs. Thorn's youngest child, Morm Hon, who is just 13 years old greeted the board members. He reluctantly informed the visitors that he was not attending school because he was concerned for his mother's health and needed to tend the farm. His mother was experiencing fainting spells, fever, dizziness and general fatigue; which were symptoms resulting from the bullet still embedded in her body. Thanks to the compassion of generous Canadians and FH Cambodia staff, Mrs. Thorn received medical care this past May 2013. Doctors were able to remove the bullet in her back that had caused her such pain and complications since 1983. And 30 aching years were met with relief and joy. "Now after surgery I feel fine, no burning pain at the wound site - I am very happy. I would like to thank you very much to my helper/donors. I never thought that anyone could help me, but now I have many Canadians that could help me Thank you very much also for FH Cambodia staff in helping me with this issue!" Mrs. Thorn has recovered from surgery and her progress has enabled her youngest son Morm Hon to return to school. He is currently studying in grade four and happy to be where children his age should be.